Sometimes it isn't so much what you say as how you say it. Other times it's exactly the other way around, which is why I'm known as The King of Faux Pas. I have a bad habit of blurting out things that might be considered humorous under certain circumstances, but inappropriate and hurtful when the subject is of a serious, personal nature. Ridiculing someone's damaged septum falls under the latter category. When I walked into the café, the manager was busy with her usual duties. But she found the time, as always, to offer a greeting and a smile, which makes all the difference between just another customer and a welcome guest. This is one of the primary reasons for the restaurant's success; I don't know how much the owner pays her, but it isn't enough. Anyway, I settled in at my usual table and began reading my paper, as I always do. I was lucky this day because all the waitresses had their hands full, so the manager came over to my table herself. This is always fun. I love her lighthearted personality, and she always has something interesting to say. This time, however, Liz wasn't quite as lighthearted as usual, and I noticed a lot of sniffling. "Sounds like you have a cold," I say. "I don't know what this is, exactly," she replies, looking a bit glum. "I went to the doctor the other day, and she says I have a perforated septum. It was news to me." I have to think about that one for a moment. It doesn't sound like a good thing, but I'm no expert when it comes to nose stuff. I decide to engage. "Like a hole, you mean? How did that happen?" "The doctor thinks it's been that way for a long time. She tried to tell me it's from drugs." I laugh. Liz isn't the sort of person who uses drugs, and everyone knows it. But I decide to run with it anyway. "Well," I say, "that would explain it. All those years of snorting the white stuff have taken their toll." "Yeah," she says. It's clear this is no laughing matter to her. "I told her over and over, I've never used drugs! She just kept telling me I had. It was crazy." "Maybe you just don't remember?" I offer, with a look of skeptical concern. I know I'm deadpanning my way into trouble as usual, but I can't stop. She manages a small laugh. "Right. That's probably it," she replies. "So . . . how long has it been this way?" I ask, attempting to steer toward rationality. "Probably since I was little. I had a bad sledding accident and I broke my nose. My dad just stuck his fingers in there and . . . " She makes a skrunking sound. Disgusting, I think to myself, envisioning the situation. My daughter's nose was black and blue for a week after a sledding accident of her own, I remember. Probably broken, too, but at that age the cartilage is so soft that the event is considerably less than catastrophic. In both cases, the result is nothing but positive: a nice, petite, and wholly attractive nose. At least from the outside. "So what now?" I ask. 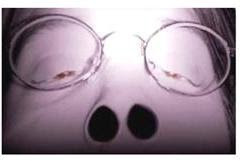 "Your nostrils can see each other, and that's that?" Liz sits down, looking even more glum than before. "No," she says, "eventually it collapses." I can feel the faux pas coming on, but there's nothing I can do to stop it. I try to choke back the mirth that's welling up from the weird visuals playing in my mind. Her nose just collapses. How bizarre. "Like foomph? One minute it's there, and the next minute it's just . . . what . . . like a little pancake?" I hate myself, but I have to say it anyway. "I guess," says Liz, trying to see the humor in it. "They say I'll need reconstructive surgery, but I hate surgery. I don't want surgery!" Oh crud. Here we go. With superhuman effort I manage to keep the tea from spewing out of my nose and mouth, but now I'm choking from the combination of liquid and unbridled mirth. "No!" I gurgle, "you can use this! One big nostril! Change your name to Nostrildamus and set up shop as an oracle! You'll be famous!" The look on her face isn't unfamiliar to me; I've seen it over and over through the years. It's a combination of confusion, pity, and disgust. If the look had a voice, it would be telling me how pathetic I am, and how sick. It would be wondering why I'm walking around, free. If the look had a gun, it would shoot me. Liz pulls a pen from a pocket. She's ready to take my order now, and I know it may be the last meal I ever eat. In this life anyway. This story is almost painfully hilarious! Jaw-droppingly, side-splittingly funny! One of my favorite lines: "I try to choke back the mirth that's welling up from the weird visuals playing in my mind." I picture those court jesters in old movies who simply can't stop wisecracking when the king is having a bad day. And they invariably get their heads lopped off! Another favorite line: "I can feel the faux pas coming on, but there's nothing I can do to stop it." Fantastic! Thank you, Craig. Your comment couldn't have come at a better time. I had just finished rereading the story and was contemplating gouging out my eyes when your words arrived. Here's hoping "Liz" doesn't dismember.